The winner of the Scrabble Game Giveaway is Amanda email address kat_ofthe_night@yahoo.com. A few days ago, in the middle of the black night I heard these words whispered from a small boy at the side of my bed. Um. Are you kidding me? It’s the middle of the night. Shouldn’t you be sleeping and shouldn’t I be sleeping and shouldn’t someone, somewhere! do something about your growing addiction to the Wii and oh boy, how am I going to get back to sleep now and why does the winter seem so long and dreary and why is it that I can’t seem to find enough exhilarating, educational and productive activity for you and your 5 year old twin brother and how am I going to keep you entertained for the rest of the long and dreary winter and holy cow I’m going to be tired tomorrow. If you thought I had a peaceful nights sleep after that, you are mistaken. They are my babies, you know. Only they aren’t really babies, just the youngest of my 5 kids and what in the world will things be like when they all go to school every day, I am wondering! It is yet to be seen. I’m wishing it would come along a little later than sooner. You know what I’m saying here? 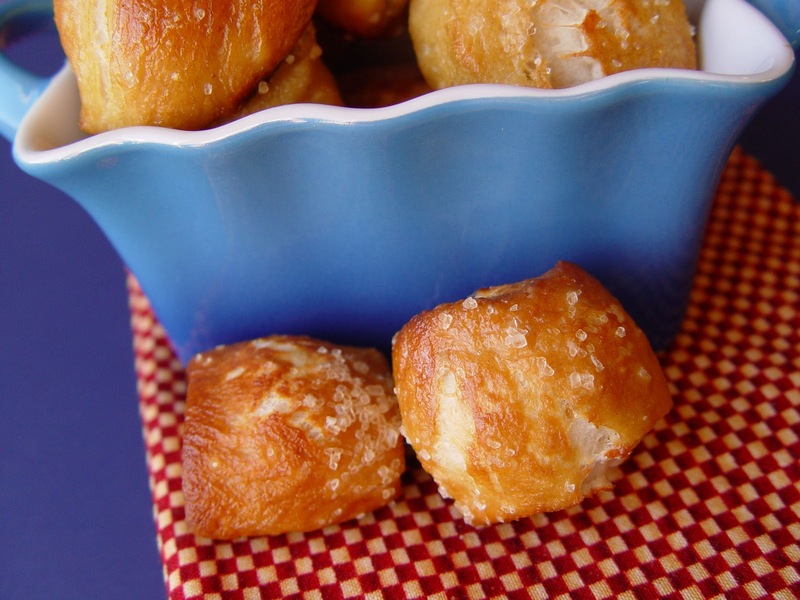 In the mean time…I think my boys and I’ll make these Soft Pretzel Bites a few more times. Beats playing the Wii…any old day. 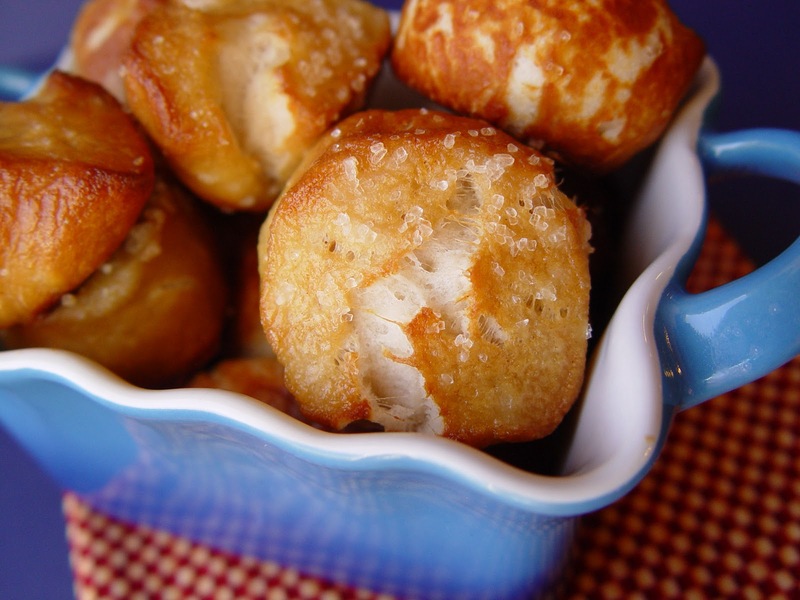 These fabulous Soft Pretzel Bites are a treasure to behold. I found the recipe over at Two Peas and Their Pod. If you haven’t visited this lovely site, I recommend you do! There are many tasty recipe to be had there. These Soft Pretzel Bites are a fun activity for kids on a cold winter day. They would also make a fabulous addition to your super bowl party. I hope you love them as much as we did! 1. Pour 1 1/2 cups warm water into your stand mixer. Mix it together on low, just for 30 seconds or so. 2. Let it sit for about 5 minutes, allowing time for the yeast to start to bubble up a bit. and 2 cups of the flour. Turn your mixer on to low and add the rest of the flour, 1 cup at a time while the mixer runs. You know you have enough flour when the dough pulls itself away from the sides of the bowl. 4. Turn your mixer to medium speed and let the old girl mix for 5 minutes. or until doubled in size. 7. While your dough is resting, pour 12 cups of water into a large stock pot and bring it to a boil and pour 3/4 cup baking soda into it. If it starts to get super frothy, turn it down a bit. 8. Roll each dough piece into a long rope shape. 9. Cut the rope into little chunks, about 2 inches wide. 9. Drop the little dough pieces into the boiling water and let them boil for 1 minute. You can boil about 15 at a time. 10. Take the dough out of the boiling water with a metal strainer, or slotted spoon. Let all of the water drain off the dough and back into the pot. and then sprinkle a bit of course pretzel salt over the tops. 12. Bake the bites at 425 degrees for 12-15 minutes or until golden brown. 13. Remove the pan from the oven and let the bites rest for at least 5 minutes before you dig in. Maria from Two Peas and Their Pod has a great cheese sauce posted with this recipe, if you want to check it out on her pretty site. in the recipe itself you said use baking powder. In the instructions you said baking soda. Which one do we use?I'm confused.Thanks. Thanks for catching my mistake. You need only baking soda. I can't wait to try this with my three-year-old boys! And can I say that I love the knife you use. I have been admiring it in several posts. What kind of knife is that? I don't think I have ever seen one like it, but I want one!! Can you purchase the pretzel salt at the grocery store or is it a specialty item? You can find pretzel salt at the grocery store. Coarse Sea Salt would also work. Good luck! Hope you can find it easily. So glad you liked the pretzel bites! I'll try these tomorrow. Yum! I made your Bean with Bacon soup for dinner tonight and it was a HUGE hit! Can't wait to try some more of your recipes! Oh- and I pureed the soup then added one can of the beans whole. It's good either way though! So yummy!! I made these today with my kids but I only made 1/2 batch. I wanted to try them before making them for a Supberbowl party we are going to. I will definitely be bringing these to the party! I made the cheese sauce & added a bit of dijon for a little extra kick. My family can't stop eating them. Can I just say a huge THANK YOU! I was looking at your step by step instructions like I always do, and I realized that you must sit there with a camera and think about all the places we might need some extra help with a visual. I am sure it interrupts the flow of your cooking, but you do it anyway. Not to mention the time it must take from your cute family. I just want you to know that your effort is not unnoticed. Your blog is exceptional along with your recipes. You could just keep it to yourself and your family but you share. I think that is amazing and note-worthy. Thank you again for all your time and effort to help us be better cooks and people. Yes, mine are were really soft on the inside with a chewy exterior. They should have a texture similar to a bagel. Glad you like them! I made these with my 6 and 8 year old yesterday… lots of fun! They made some with salt, and others with sugar and cinnamon. I also made your mint oreo cookies for a baby shower the other day… BIG HIT!!! You are the best. DITTO to what Maleen said above! Thanks for all your hard work. Hi Jamie – we made these today for my daughter's preschool class. I'm sure they're going to be a hit as my daughter can't keep her hands off of them! These are soooo good. I ended up making them with 1/2 whole wheat flour because I didn't have enough white flour. Turned out well and I am really enjoying them! Thanks! Hi Jaime — I just barely got done making my first batch of these. I used 3/4 of the flour whole wheat which seemed to work for me, too. I love how soft these pretzels turned out inside. The last time I tried to make soft pretzels I used a recipe from AllRecipes.com (I think) and it was a disaster. I have some question though… These had a really strong taste. I'm not sure if it's just the Kosher Salt or what? I swear that I used about the same as you but I can't figure it out. I did put butter on top out of the oven but I don't think that would be it. Also, if I do a batch over 12 minutes it seems to burn the outside but if I do it only 12 minutes some of them kind of taste a little doughy. Could this have to do with my boiling time? I did them exactly 1 minute in the pot. Do you have any advice on how to keep them from getting too dark where they sit on the pan? Sorry for so many questions. LAST ONE: HAVE YOU EVER TRIED TO MAKE THESE LIKE DESERT PRETZELS WITH CINNAMON AND SUGAR? Any tips on how to do that? Thanks for the great recipe!! So glad you enjoyed this recipe. Make sure you aren't using too much baking soda in the water. Try adding even more than the 12 cups next time and see if that helps with the taste. Also, be sure to place the oven rack to the middle or lower position in your oven. This will help with the darkening. Some of mine got a little bit dark, too. If you want to make them sweet, once the pretzel bites are out of the oven brush them with some butter and then sprinkle cinnamon sugar over the top. You can also make a little dipping sauce with milk, powdered sugar and a splash of vanilla. I LOVE the pictures that you add to your recipes!! Thank you! Hello! If I wanted to make these bigger instead of cutting them into smaller pieces and keeping the size of the eight equal portions, would I just have to boil them longer? How long would you say they have to be boiled for? I can’t eat egg. Could I use egg replacer? I don’t know how the egg substitute would work out. I haven’t ever tried it with this recipe. The egg is used here to create that nice shine on the bread. If you left it out they would still taste good. They just wouldn’t look as good. Good luck! Have you ever frozen these before? I haven’t ever tried freezing these. I would imagine it would work out pretty well. Let me know if you try it and how it goes. Good luck! can we not put any sugar in it if we did not want to? have a god day. My son wanted pretzel bites from the mall for the Super Bowl so we made these instead. They turned out PERFECT and better than the mall ones 🙂 thanks! !